This homage is dedicated to the American MARLENE DIETRICH, a German-born actress with a career unparalleled in the history of motion pictures. The screen idol climbed Mount Olympus and became a living legend. Famous film directors, like Josef von Sternberg, Rouben Mamoulian, Ernst Lubitch, George Marshall, René Clair, Alfred Hitchcock, Fritz Lang, Billy Wilder, Orson Welles, Stanley Kramer and David Hemmings engaged her for their movies and made her immortal on celluloid. MARLENE recieved highest accolades, but always remained loyal to her ideals. One of the greatest offers she refused, was the idea of Adolf Hitler to bring her back to the Third Reich to make films of her choice. This also meant saying no to the Nazi regime. During the war MARLENE toured the European war front and worked tirelessly entertaining the troops in USO shows. She was awarded the Medal of Freedom and made a Knight and Officer of the Légion d'Honneur. Her enjoyment of the USO shows paved the way for her public appearances. In later years MARLENE concentrated on her 'second career' as a singer and entertainer. At an age when most stars would have been happy to slip into semi-retirement, she still filled up theaters, toured and sang as 'The most Beautiful Grandmother in the World' in all four continents with standing ovations and countless curtain calls. This is a page of a DIETRICH-admirer, whose joy it has been to build up a private collection and who wishes to share it with you here. If there is any further interest, just let me know. If you do have anything interesting, rare, beautiful, or just nice about MARLENE, don't hesitate to mail me. P1167 was Marlene's employee number/code at Paramount Pictures. 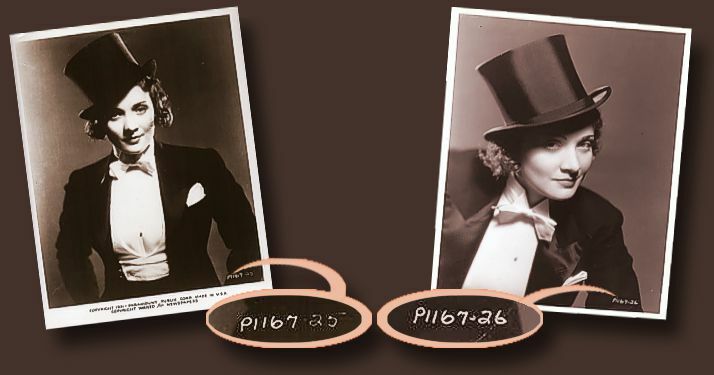 In order to get the complete overview of Dietrich's development as a movie-star during her Paramount tenure, we are attempting to find every Paramount photo in the "P1167" series, from P1167-1 through something like P1167-700, and we need your help. The search is based at the "MARLENE DIETRICH, The Last Goddess (lastgoddessblog.com)"
If you have any photos marked with a "P1167-..." code, please share them with us, email them to us so that we can add them to the galleries. Browse and enjoy my Collector's Page ! "Use of name and picture of MARLENE DIETRICH with kind permission of MARLENE DIETRICH COLLECTION GmbH, Munich"